Referred to as 'liquid soul,' red drink is not just a color, it's a flavor—and one whose supremacy is being challenged by a rising purple drink contingent. Adrian Miller, aka the Soul Food Scholar, is the author of the James Beard award-winning book, Soul Food: The Surprising Story of an American Cuisine, One Plate at a Time. Like Jarritos at a taqueria or Lucozade at a chippy, red drink is the marker of a legit soul-food restaurant—the crucial element that separates the real from the fake. What exactly do I mean by “red drink?” Well, in soul-food culture, red is not just a color, it’s also a flavor. We soul-food aficionados don’t get caught up in describing a drink as “cherry,” “strawberry,” or “tropical punch,” and we don’t say it has “hints of cranberry.” It’s just “red.” Red drinks have such a special cultural resonance that whenever African Americans gather together, there’s usually a red drink in the mix. In short, it’s liquid soul. So why is there such a fundamental love for red drinks in the African-American community? And last week, why did millions of African Americans celebrate the 150th anniversary of Juneteenth with barbecue in one hand and some sort of red drink in the other? Historically speaking, the answers flow back to West Africa. There, red drink often marks a special occasion; enslaved West Africans transferred the same social “punch,” if you will, to the Americas. Although this heritage may be unfamiliar to most, you’ve probably had two of these prized red drinks at social gatherings without even knowing it. Red drink is liquid soul. The first is hibiscus tea. Hibiscus is a plant native to West Africa, and its flower petals are used to make a tea called bissap—a hospitality drink that remains popular in several countries to this day. Depending upon the color of the fresh or dried flower petals used, hibiscus tea can range from cranberry-red to magenta-purple. As late as the 1700s, enslaved West Africans cultivated the plant in Jamaica, where a similar drink to bissap is called sorrel. As in West Africa, the hibiscus plant blooms around Christmastime in the Caribbean and is a popular holiday drink. Over time, hibiscus tea spread throughout the Caribbean and Latin America, where it is also known today as agua de Jamaica (Jamaica water). If you ever ordered that drink at a taco stand or bought some Celestial Seasonings Red Zinger tea, you tasted West Africa. The other traditional drink is kola (also spelled cola) nut tea. You may be thinking that every cola drink you’ve ever had was brown, not red. True, but look at the ingredients on any cola drink that we have in the U.S. and you’ll notice a caramel coloring. Kola nuts are red or white, and like hibiscus, West Africans use them as a sign of hospitality. Sometimes guests get the nuts to chew on, or the nuts are ground into a powder and used to make a drink. By the 19th century, kola nuts had acquired wonder drug status. They were believed to make bitter water palatable and to be a stimulant. As a result, kola nuts also crossed the Atlantic and were used on Caribbean plantations as a supposed energy drink. Given their reputation, it’s no surprise that pharmacists like John Pemberton used kola nuts as a key ingredient in new medicinal drinks like Coca-Cola. 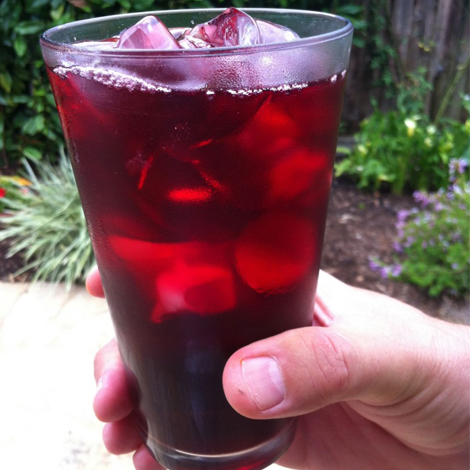 A number of other red drinks have lubricated African-American social events over time, and they share the same basic formula as kola-nut and hibiscus tea: Get some water, color it red, and sweeten to taste. Red lemonade made with cherries, strawberries, or food coloring was the choice in the 1870s and 1880s, and then transitioned to red soda pop in the 1890s as carbonated beverages became more prevalent. By the 1920s, powdered drinks reigned supreme thanks to the invention of Poly Pop and Kool-Aid. In addition to anchoring public celebrations, red drinks became firm fixtures in African-American homes and soul-food restaurants. Just like any other immigrant cuisine in the U.S., it’s the special-occasion foods and drinks that come out when cooks want to “show off” their food culture to others. The malleability of red drink inspires strong regional allegiances. Big Red dominates Texas, while Faygo is the way to go in Detroit. At Alcenia’s in Memphis, you can get a super-sweet red Kool-Aid that owner Betty Joyce “B. J.” Chester-Tamayo calls “Ghetto Aid.” In an example of borderline heresy, the Southern Kitchen in Tacoma, WA offers a strawberry lemonade topped off with whipped cream. We forgive, barely, only because the drink is red. Yet despite this rich heritage, there seems to be a generational shift currently under way that’s challenging red-drink supremacy. For me, this is an alarming development. As I traveled and ate my way through the country to research my soul food book, I’d often ask young people which they preferred—red drink, or purple/grape drink. An overwhelming number of them showed a pronounced preference toward purple drink. Comedian Dave Chapelle, of course, famously captured this trend when he offered his thoughts on purple drink and Sunny-D on his short-lived and dearly-departed TV show. It’s hard to put a finger on why this shift is happening. It may be a way for young people to distinguish themselves from older folks, or it may be a playful attempt to consume an ersatz version of the grape cough-syrup party concoction known as “purple drank.” Regardless of the reasons, the fact that red is drink is losing its favored drink status is hard for me to swallow. Thinking of getting a red drink sometimes soon? Here are some suggestions on pairing some great red drinks with your favorite foods. For spicy foods, I recommend an agua de Jamaica. It’s floral and foxy with hints of cranberry. Barbecue calls for a red drink with a big personality. 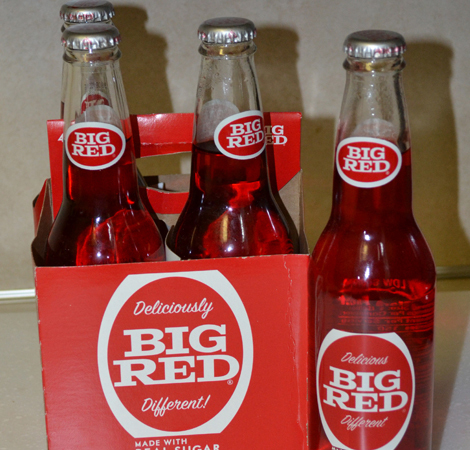 I suggest the effervescence of a 2015 Big Red soda born from the terroir of Waco, Texas. It has the crisp structure of red berries, with undertones of cotton candy. For anything else, I recommend a 2015 red (Tropical Punch) Kool-Aid. The attack on the nose is vigorous without being overbearing. The true connoisseur doesn’t object to the proper sweetness, especially when there is a great aftertaste. Naturally, it must be consumed from a jelly jar.